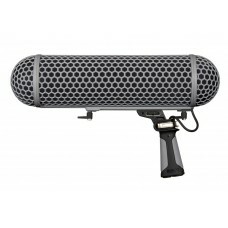 The RØDE Blimp is a complete windshield and shock mounting accessory for the NTG-1, NTG-2 and NTG-3 microphones, as well as any third party shotgun microphone up to 325mm (12 ¾") in length. The Blimp attaches to any standard boom pole via 3/8" thread attachment at the base. To reduce weight, the Universal Blimp Mount is available as an option to remove the handle when the Blimp is being used primarily on a boom pole. The RØDE Blimp comes with a full 10 year warranty. The warranty excludes normal wear and tear of the Dead Wombat furry cover or any misuse, modification, or improper storage and transportation of the product.